To put it concisely, the Old Testament was the Gospel of Jesus, written in types and shadows. Now, speaking of types and shadows, the sanctuary service, used by the children of Israel, should be mentioned. It was an integral part of God’s Salvation plan. But this sanctuary service was not merely for the purpose of meaningless rituals, but was a picture of spiritual concepts. It was filled with types and shadows, pointing forward to the long-promised Messiah to come. Now in that sanctuary service was the altar. But even before the sanctuary service, the altar was used by God’s people. From the days of Adam, the worshippers of God used altars as an important part of worship, which altars were a type and shadow, pointing to Christ. From the crude altar of Kane and Abel, to the family of Noah (as Noah and his family gave thanks for God’s providence during the Great Flood), altars were used, prior to the sanctuary service. Our great God has been pleased to accept the consecrated sacrifices of His people, upon these altars. Now in the sanctuary service, two types of altars were used: one for sacrifices, and one for incense. For centuries, the Jews obeyed the commandment of God to perform the ritual of the temple service, offering animal sacrifices, not realizing just why God desired animals to be slain, as an atonement for sin. Day after day, year after year, the temple priests performed these daily and yearly sacrifices. The common people among the Jews brought their lambs and goats, etc., to make payment for their own sins. But in the fullness of time, God sent His Son to this sin-laden planet, to become the ultimate sacrifice for sin. God called His Son, Jesus, the “Lamb of God”. Not by the blood of bulls and goats, but by the precious blood of Jesus, was the true payment for sin accomplished. God has written these concepts in the heavens. And God foretold that there would be signs in the Sun, Moon, and Stars (see Luke 21:25). 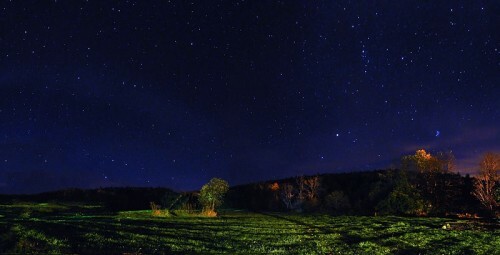 But though the Bible hinted, in various places, that these signs would tell the Gospel story, we just didn’t realize that God had arranged the constellations in such a way, that an elaborate pictorial scenario of the Gospel, a heavenly parable, was carefully inscribed in the night sky. Signs Of Heaven Website is dedicated to presenting this heavenly love story, which God is now revealing. Above constellation: The Cross of Orion. Appears first in October, when Orion stands upright in the pre-dawn hours. Appears to stand upright a little earlier each night. Moves from East to West, as do all constellations. 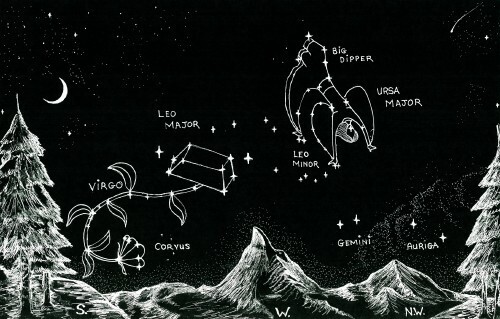 This Revelation 12 Woman Constellation, as seen in these two star-charts, is made of the Ursa Major Constellation. However, the ancient pagan cultures did not see this constellation as God intended it to be seen. They only saw it as a bear. But it is actually a headless woman in childbirth. This is seen in springtime. It is seen in the northern skies. 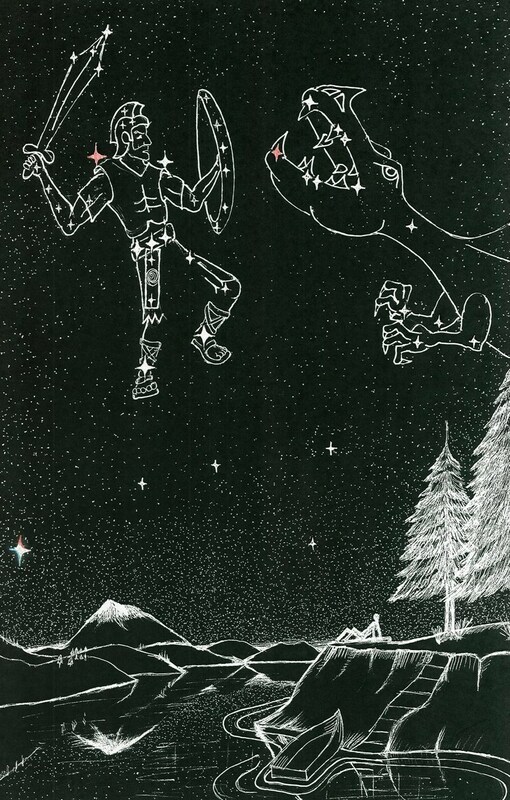 The 7 Stars (The Big Dipper) is easy to see with its very bright 7 stars, and comprises her torso and one of her limbs. But the entire Revelation 12 Woman (Ursa Major ) must be seen on a darker starry night, somewhat away from many city lights. This Revelation 12 Woman appears to be fleeing, as written… “And the woman fled into the wilderness….And to the woman were given two wings of a great eagle, that she might fly into the wilderness, into her place, where she is nourished for a time, and times, and half a time, from the face of the serpent.” Revelation 12:14. OK, so this woman (who represents God’s people) is fleeing from the serpent (Satan). But upon closer examination, it appears that she is casting Gospel seed from her left foot and from her left hand. One reason why this woman appears to be coming out sideways instead of appearing that she is rising, could be this: This Altar is in the south. The Woman appears to be rising northward. So in a sense she is rising…heavenward, represented by her northward position from the Altar in the south. So right here we have a biblical concept of incense rising to God (northward) to Heaven as a sweet-smelling savor. And the above verse… “promotion cometh neither from the east, nor from the west, nor from the south”, puts a confirmation on God being Northward. Notice that every direction is mentioned in this verse, except north. So in essence, that while promotion comes not from the east, west or south, it must be implying that promotion does come from the north, where God is, up in Heaven. So then this woman is rising northward…to God, who promoted her to her exalted position, as she rises from this Golden Altar. EDITOR’S NOTE: The stars on these sketches are not perfectly accurate. But they are hopefully close enough for you to locate these constellations. This constellation group presents the biblical concept of laying one’s life on the altar… of “self-sacrificing service” to God. OUR CHRISTIAN SACRIFICE… “I beseech you therefore, brethren, by the mercies of God, that ye present YOUR BODIES A LIVING SACRIFICE, holy, acceptable unto God, which is your reasonable service.” Romans 12:1. This seems to be the key verse in the Bible concerning this constellation group. It is seen from these four passages above, that the temple altar was pointing to a New Testament spiritual fulfillment. The Old Testament altars were for incense, pointing to the New Testament, ‘prayers of the saints mingled with Christ’s atonement’. Likewise, it is seen that the animal sacrifices on the Old Testament altar were actually pointing to Christ, the Sacrificial Lamb of God. This heavenly picture of the Woman rising up from the altar, presents an incredible portrait of how God’s people are, like Paul, being offered on the altar of “sacrifice and service”. As 1st Peter 2:9 says, we New Testament Believers are to be a, “Royal Priesthood”. One evidence that we are in watchful communion with God is when we are to, “pray without ceasing”. As we go about our daily duties, we are to be, “instant in prayer”, for ourselves and for those in need around us. So also, the closer we come to Christ, the greater will be our desire to give of ourselves and of our means for the ambassadorship and proclamation of the Gospel. This degree of service requires us to live a life of faith and self-denying submission to Christ. This kind of self-sacrificial service can only be found when we maintain a constant watchfulness, “looking unto Jesus”. Above sketch is the Woman Upon the Altar, along with the Flower of Heaven Constellation. This group can best be seen in latter winter when they are in the west. The altar of incense was in the holy place of the tabernacle. This tabernacle was only for priest to enter. The garments of the priest included what the above verse describes as an engraving of gold with the words, “HOLINESS TO THE LORD”. This was placed on the mitre of the priest on the priest’s forehead. The obvious inference here is that the forehead is where the human mind is. And in the human mind is where holiness is to exist. Over the Altar Constellation reminds us of this great commission which God has given to His people. Listen to the New Testament… “Ye also, as lively stones, are built up a spiritual house, an holy priesthood, to offer up spiritual sacrifices, acceptable to God by Jesus Christ.” 1st Peter 2:5. If this Woman symbolizes the Church, then this is a picture of the Church rising from the golden altar. But we have abundant admonitions from both the Old and New Testaments that God has chosen us to be a Royal Priesthood. Such knowledge as this should really have a sobering effect upon every child of God. The office of priesthood was such an exalted position in the days of the temple service. Priests were to be holy in all manner of behavior. The word holy is a sobering word, just in itself. First it implies a total devotion to God. Second it implies a reverence in both word and behavior… “But as he which hath called you is holy, so be ye holy in all manner of conversation; Because it is written, Be ye holy; for I am holy.” 1st Peter 1:15, 16. “But ye are come unto mount Zion, and unto the city of the living God, the heavenly Jerusalem…See that ye refuse not him that speaks. For if they escaped not who refused him that spoke on earth, much more shall not we escape, if we turn away from him that speaks from heaven… but now he hath promised, saying, Yet once more I shake not the earth only, but also heaven…whereby we may serve God acceptably with reverence and godly fear…For our God is a consuming fire.” Hebrews 12:22, 25-29 condensed. While we are to come boldly to the throne of grace (Hebrews 4:16), we are by no means, to come presumptuously. As we, by faith, enter into the heavenly sanctuary, we are to come with all the consecration of any Old Testament priest. Our words, our demeanor should be Christ-like in every respect. Our prayers for our own self, and for others should be heartfelt. We are to imitate Christ. Oh yes, we must come boldly to the throne of grace, just as Esther came boldly into the throne room of the king. But let none of us come presumptuously. It would be wise to read the story of the “Publican and Pharisee” .The Pharisee came into the temple thinking he was righteous. The Publican, however, came crawling on his knees, begging for the mercy of God, ashamed to even look upward. When we come to God in prayer, let’s come boldly as did Esther. She was ready to die. And though she came boldly, she did not come presumptuously. She and the Jews all fasted for three days. She also put on her royal garments (that would be as our clean white garments of Salvation). And even though we come to God as did Esther, we still need to come as did that Publican. Not thinking we have any righteousness, like that Pharisee. But we are to come humbly, as was that Publican. So many of these Bible stories fit wonderfully together. And the more we know of these Bible stories, the greater will be our understanding of God’s holiness, and of our great commission to seek after the same Christ-like holiness. But never, never should we think critically of others, as did the Pharisee in this parable. Scorning others is a clear sign that our lives are not right with God. We should flee from any circumstance which causes us to judge others. All such judging and scorning is a great sin, and should be avoided at any cost. And think about it. If we are praying for others, then we will ultimately be hoping the best for them, instead of judging and scorning them. Oh yes, we might see someone doing something wrong. But we are not to judge the motives of the heart of another. Now, of course, coming boldly to God’s throne of grace has to be done by faith. There is no actual temple we can enter. This can be accomplished while walking, while working, as we lie down, or rise up. Such a life is a joyful life. The Holy Spirit makes it thus… “I am crucified with Christ: nevertheless I live; yet not I, but Christ lives in me: and the life which I now live in the flesh I live by the faith of the Son of God, who loved me, and gave Himself for me.” Galatians 2:20. This is the crucified life. A miraculous transformation, which God performs in us. We grow into this life. It doesn’t always instantly happen, once we are baptized. But if it does for some in these last moments, well, that’s wonderful! But this is a secret life. Nobody else can understand unless they too are part of this royal priesthood. And God has His ways to keep us from getting proud over our exalted position… “And lest I should be exalted above measure through the abundance of the revelations, there was given to me a thorn in the flesh, the messenger of Satan to buffet me, lest I should be exalted above measure.” 2nd Corinthians 12:7. Paul (in picture to right) had some sort of assault by Satan, which took away any pride that he might have otherwise been filled with. And so the invitation goes out to anyone who is willing to renounce this ungodly world, and become a part of this holy nation and royal priesthood. Is anyone willing to become Christ-like? When Jesus bids us, “Come follow Me”, He is not only wanting us to learn of Him, but also to follow Him into the Most Holy Place…by faith. Are any of us willing to be a priest for Jesus? Is anyone willing to leave behind this careless, sacrilegious, joking, flippant world, and enter in to the solemn office of priesthood? With Jesus? Oh yes, we can carry on the duties of priesthood, even at work, or at home, or at recreation with our families. No matter where we are, we can silently pray, meditate on God’s Word, and proclaim Jesus to the world, by our Christ-like example. AM I A CONSECRATED PRIEST? Am I fully consecrated to be a priest in God’s Most Holy Place? Am I ready to cry day and night in behalf of God’s people, who are still captives in spiritual Babylon? Am I striving to cleanse myself from every trace of defilement, so that I might stand before a holy God? Not to forget Paul’s exhortation… “Having therefore these promises, dearly beloved, let us cleanse ourselves from all filthiness of the flesh and spirit, perfecting holiness in the fear of God.” 2nd Corinthians 7:1. And what about Peter’s exhortation to holiness… “Seeing then that all these things shall be dissolved, what manner of persons ought ye to be in all holy conversation and godliness, Looking for and hasting unto the coming of the day of God, wherein the heavens being on fire shall be dissolved, and the elements shall melt with fervent heat?…Wherefore, beloved, seeing that ye look for such things, be diligent that ye may be found of him in peace, without spot, and blameless.” 2nd Peter 3:11, 12, 14. Is there anything in this verse that suggests that God will accept anything less than complete holiness from His royal priesthood…us? When we choose to follow Jesus, we begin to more and more understand the high and holy calling we have from God. Just read Peter’s Epistles. Just read John’s Epistles. These once were just ignorant fishermen. But through purification of soul, they became priests for God. God has not given the apostles for us to adore on a pedestal. They are role models for what God expects us to become. Holman – The Mercy Seat – Wikipedia – Public Dom..
Now this next article is a continuation of the article you have just read. This constellation is clinging to the Altar Constellation. 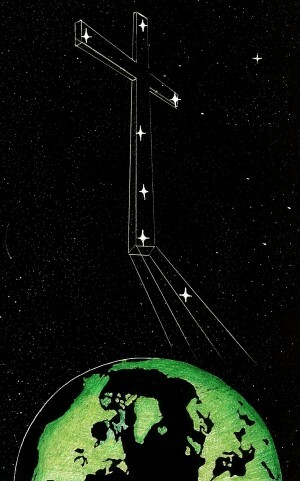 It almost appears as a vine, as it projects out from the Altar/Ark Constellation . It seems to be the perfect ending to this heavenly parable, known as the Signs Of Heaven, since this story began with a flower, which bowed down and withered: The Flower of the Field Constellation.